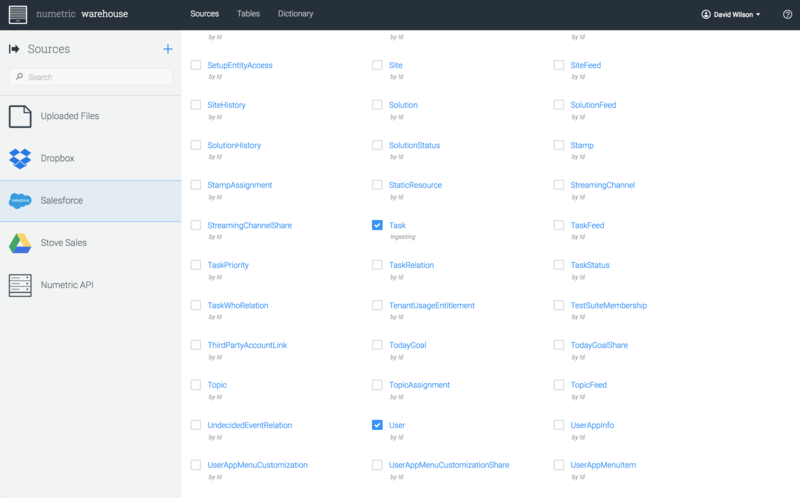 Everything you need to know to connect Numetric to your Salesforce data. 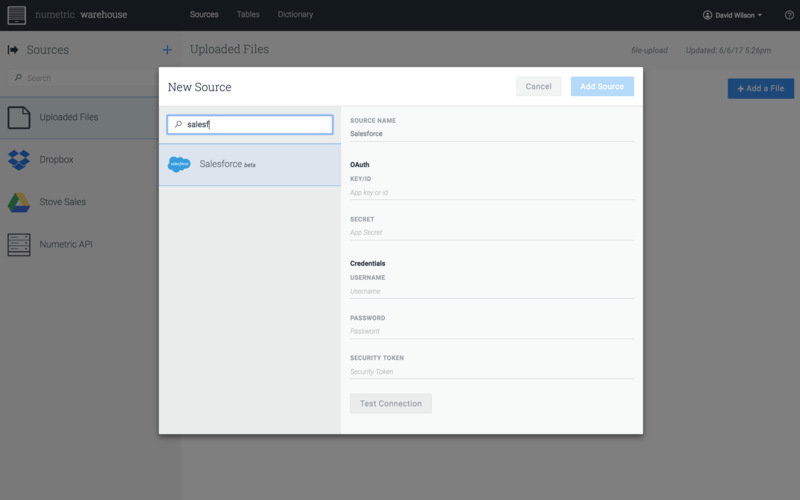 Numetric makes it easy to connect to your Salesforce instance to extract the valuable data found there. This guide provides a step-by-step walkthrough of the process. Items 1–3 are associated with your user account, and you should know items 1 and 2 without a problem. If you don’t know (or have forgotten) your security token, you can follow the instructions here to reset it: https://help.salesforce.com/articleView?id=user_security_token.htm&type=0. For Items 4 and 5 above, you’ll need to use the Salesforce App Manager to create a new “Connected App” that is allowed to use the Salesforce API to access your organization. Instructions for completing this are found here: https://help.salesforce.com/articleView?id=connected_app_create.htm&type=0. As you create the connected app, you’ll need to enable several options in order to obtain the correct OAuth credentials. Add the “Access and manage your data (api)” scope under “Selected OAuth Scopes.” No other scopes are needed. After you create the new connected app with the OAuth settings above, you’ll be able to get the OAuth Key or ID and the OAuth secret for the app you just created. 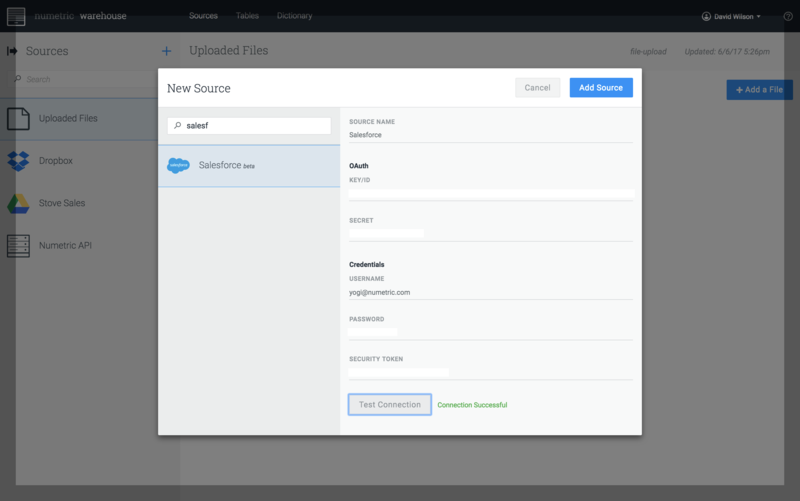 Once you have all of the necessary security credentials, initiating the Salesforce connector in the Numetric Warehouse is very simple. First, navigate to the “Sources” page within warehouse. Click on the “+” button at the top of the list of sources along the left side of the page. 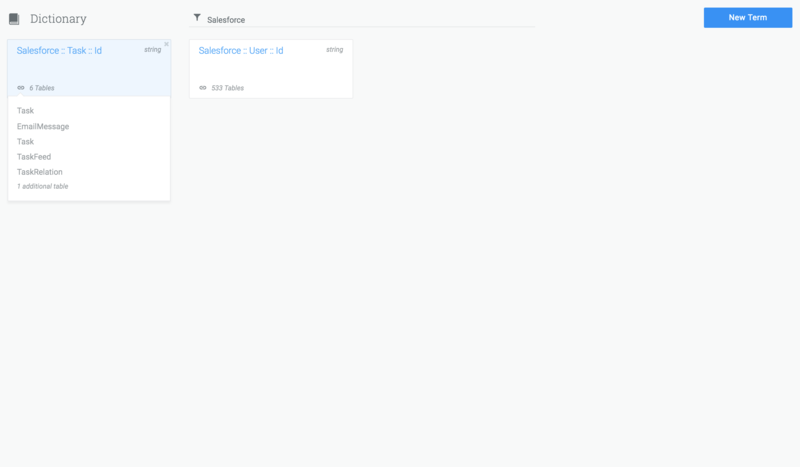 In the New Source dialogue box, scroll down (or search to filter) the list of connectors to find the Salesforce connector. Provide a name for this source, and then use the security credentials you gathered in Step 1 to authenticate to your Salesforce instance. If desired, you may use the “Test Connection” button at the bottom to ensure that your credentials were entered correctly. With the connection test successful, you are ready to click the blue “Add Source” button to finish adding the connector. 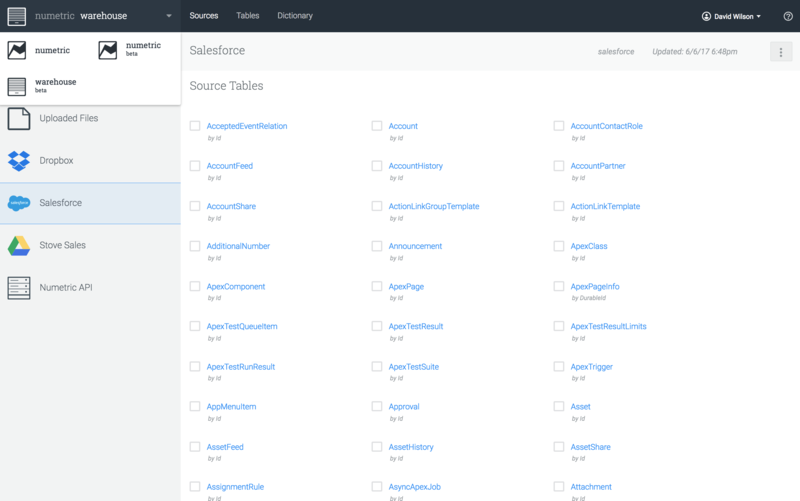 After adding the source, you’ll see its list of tables populate as the connector accesses your instance of Salesforce and read the database schema. Depending on the number of tables, this can take a few minutes. Simply click on the table name to see a preview of the data in that table. For each table that you’d like to import into the warehouse, check the blue checkmark next to the table name. Tables like Opportunity, User, and Task are probably tables that you’ll want to bring in, among others. 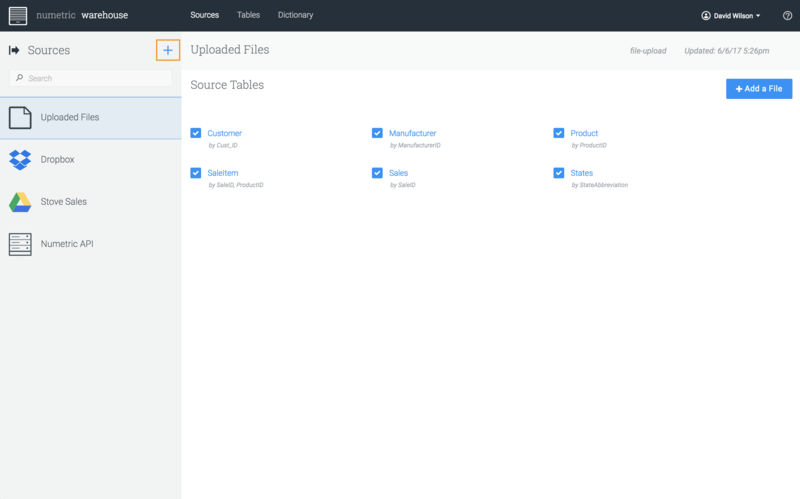 Once you’ve decided which tables should be imported in Step 2, each selected table will appear as a Warehouse Table in the Tables area within the Warehouse. If you need to do any cleaning or transformations, those rules can be applied here. You can consult the help center articles describing this process for more information. With your Salesforce data being imported into your warehouse, and the relationships automatically established within dictionary, your Salesforce data is ready to explore. You’ll first need to assemble a Dataset from the associated warehouse tables. Details on dataset assembly can be found in our help center. With a Dataset assembled, you can build a Workbook with metrics that summarize and analyze the data in the Dataset. Details on Workbook creation can also be found in our help center. And of course, if you run into any trouble along the way in connecting to your Salesforce data, reach out to our customer success team using the “Chat with support” button under the question mark button in the menu bar.